The Church has never stood on the position of absolute pacifism, like that of Tolstoy, who taught never to resist evil at all. The Church has never taken the position that if an enemy is invading your homeland you should let it be torn to pieces. 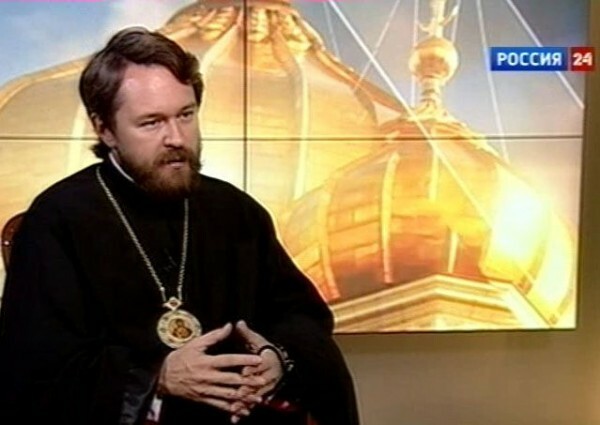 On September 20, 2014, Metropolitan Hilarion of Volokolamsk, host of the Church and the World talk-show on Vesti-24 TV network, had as his guest Russia’s People’s Artist Vladimir Khotinenko, a filmmaker, actor and script writer. Metropolitan Hilarion: Dear brothers and sisters, you are tuned to the talk-show “The Church and the World”. 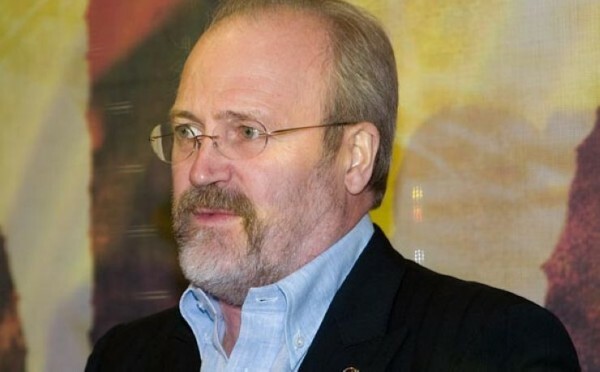 This year marks the centenary of the beginning of World War I, and today we will discuss its lessons with Russia’s People’s Artist, the author of the famous series “The Death of an Empire” devoted to exactly that period, Vladimir Khotinenko. Good afternoon, Vladimir Ivanovich! Khotinenko: Good afternoon, Your Eminence! I am lucky in a sense because in my work in cinema I presented various periods in the history of our Motherland – the Time of Trouble and the hard historical period when the empire was shaken by the First World War to be followed by the Great October Revolution, etc. I have more or less managed to study all these periods and made a lot of discoveries. They have not changed my opinion about historical processes though. It has not happened so that the Whites have become my heroes while the Reds my enemies, but what has become more significant for me is the extreme rupture within families when brother rises against brother. Metropolitan Hilarion: Regrettably, humanity has proved to learn lessons very badly and to quickly forget the events that happened one hundred years ago. Therefore it is important that people should be reminded of them through such things as The Death of an Empire series, which I saw this summer because I thought much about the events of the World War I and its preconditions and consequences. It is amazing that when the war began, Russia’s joining it was supported with universal enthusiasm. People longed to go to that war as if they believed that it would help to solve all the problems. And this enthusiasm was characteristic of not only Russia but almost all the countries drawn into that war so willingly and quickly. Within just a few days in August, half of the civilized world was drawn into the vortex of war. Each country thought it was a matter of blitzkrieg. There would be a rapid successful military operation which would help to resolve the accumulated political problems. And no one could imagine of course how catastrophic the consequences of that war will be. But what were the results? Not a single political problem was solved. On the contrary, all the problems only aggravated and led twenty years later to another world war. Millions of people were killed: 10 million troops, 12 million civilians and over 50 million were wounded. And these are relative figures because nobody knows the exact figures concerning either the First or the Second World War. Four world empires collapsed and disintegrated. Russia, which seemed to be winning in that war, especially in 1914, ultimately lost. Already the new Bolshevik power, which carried out its propaganda using Germany’s money, signed a disgraceful peace treaty whereby vast territories departed from Russia and over 50 millions found themselves outside the Soviet Union. The war waged largely in the interests of other countries had catastrophic consequences for Russia, although at the time of her joining the war there was universal enthusiasm as if a war could help resolve all problems. Khotinenko: In my series “The Death of an Empire”, there are many key moments. I like the sequence where the principal character, an officer played by Sasha Valuev, kills a little soldier, who is a bad soldier, perhaps a villain, but he suddenly feels a beast awakening in himself, and this stops him. Nowadays it is so natural, indeed. But the most terrible thing is the beast living inside a human creature. Recently I have noticed a phrase in one of the prayers in the preparation for Holy Communion. It was written by St. John Chrysostom. I have read it many times: “lest I become the prey of the wolf of souls”. And I suddenly realized that there is a certain key in these words so striking in their mysteriousness. We can be caught in the net of this dark force not controlled by anybody, which invades the human consciousness from outside and destroys it. In their thoughts, people can be both nobler and meaner than they actually are. Indeed, everything is first born in our thoughts, in our minds. What do you think? Metropolitan Hilarion: In the human being, there is the spiritual principle and the animal principle because in our physical nature we are close to animals, not herbivorous but predators at that. Our organism is built so that in our nature we are predators. That is why we eat meat and fish. But there is certainly the divine principle in the human being as well. Indeed, the human mind is a battlefield for these two principles, and the Church always seeks to help human beings to release their divine principle so that it may become the principal motivator of their actions. War, on the contrary, releases aggression and cruelty, these savage instincts, when the idea is impressed on people that those on the opposite side of the barricade are enemies to fight with and that they should die in order to defeat these enemies. Putting at risk one’s own life, a person, unlike an animal concerned for its survival, asserts his identity, eager to win the recognition of the other and, moreover, to subject this other to oneself. War awakes the animal instinct in the human being, and actually it is what everything is built on: the one will win who will be more brutal. That is why all kinds of atrocity, crime and brutality are committed during war. During war there is no moral code. Even if there are some rules, they are violated; a human being commits crimes because there is aggression in him. Applicable to war is the Latin aphorism: homo homini lupus est, because beast should be beast; it should win by all means. But moving back to World War I, we know that it began as a war between powers but ultimately in many countries, including Russia, it grew into a civil war. That is, people first were taught to see an enemy in their adversary and then people began to see an enemy now in their brothers and sisters. Khotinenko: In this case, what each one can do to avoid fratricide? Metropolitan Hilarion: I believe that each one can fulfil one simple commandment to live one’s neighbour like oneself. Yet in the modern world it is not easy to fulfil it, for the entire reality around us resists it, as if saying: this one is not your neighbour but your enemy; that one is not your neighbour either but an enemy. But Christ says that we should love all, even enemies. To love the neighbour like oneself means to overcome the illusion of duality, when we draw a line between ourselves and our neighbours, when I am subject while my neighbour is object. To love one’s neighbour like oneself is essentially to live in unity without drawing distinction between myself and my neighbour. The Church has never stood on the position of absolute pacifism, like that of Tolstoy, who taught never to resist evil at all. The Church has never taken the position that if an enemy is invading your homeland you should let it be torn to pieces. The same St. Sergius of Radonezh, who was very far from politics, a man of prayer and ascetic, when the fate of the homeland was at stake, he blessed Dmitry Donskoy and the Russian warriors for the struggle of liberation. It means that in some cases this struggle is really necessary. But the principal responsibility for wars lies on political leaders who unleashed wars and who, for the sake of some economic, and financial interests, are ready to waive people’s lives. This is what is terrible. Khotinenko: Honestly speaking, I believe, too, that if the seed of love of one’s neighbour is not sown in each human being from one’s childhood, then simply noting will come out later, for we are prone to become victims of game; we are easy to be manipulated if we have no inner pivot. And God willing, we will manage to grow a generation with the spiritual and moral pivot, ready at any moment to rise in defense of our neighbours, Motherland and the Orthodox faith. Metropolitan Hilarion: The terrible war affected each of us; it stormed into every family. My grandfather was killed during the war; another grandfather of mine went through the war to reach Romania and then came back home crippled by war. Everybody was affected – my parents and grandmothers… The sore point “only if there would be no war”, that was continuously heard at that time, has passed away together with that generation. Nowadays not only the new generation do not know from their experience what war is, but their parents either, thanks God, do not remember that terrible tragedy. All wars begin in people’s minds, in human culture. Indeed, each of us confronted people of aggressive culture at some time. Dostoyevsky spoke about it in Demons, which you have cinematized in a film of the same name. Violence, people’ deaths and their suffering – all this fermented first in the minds of those whom Dostoyevsky called “demons” and only after that was put into action in real life. Khotinenko: We know that faith is the foundation of life, the foundation of love; religion is the most important source for the code of moral rules and values. But if a person is not initiated to the Church, where can he find a spiritual support to guide him? Metropolitan Hilarion: It seems to me that for a person from whose life the religious dimension is absent, there is still the moral dimension, the moral law that God has laid in the heart of each regardless of whether this person believes or not. And in each person there is a potential of the good, the divine light that is the reflection of God Himself in us.